Mad Maxim Letunov, a hero emerging from the wasteland that is post-Whalers Hartford. In Hartford, more so than most places, there exists the temptation to get stuck in the past. As the city has sunk deeper into economic decay and regional pride has eroded slowly into self-loathing, the halcyon days of Whalermania make for a potent dose of soothing nostalgia. But we all know what came just a few years later; a series of blows from crooked owners and dirty politicians which have left us staggering to this day. But there is a new hope in Hartford. After the many false starts and disappointments, from the Patriots debacle to the unfulfilled promise of the Connecticut Whale experiment, I’m cautiously prepared to say that this time it’s for real. 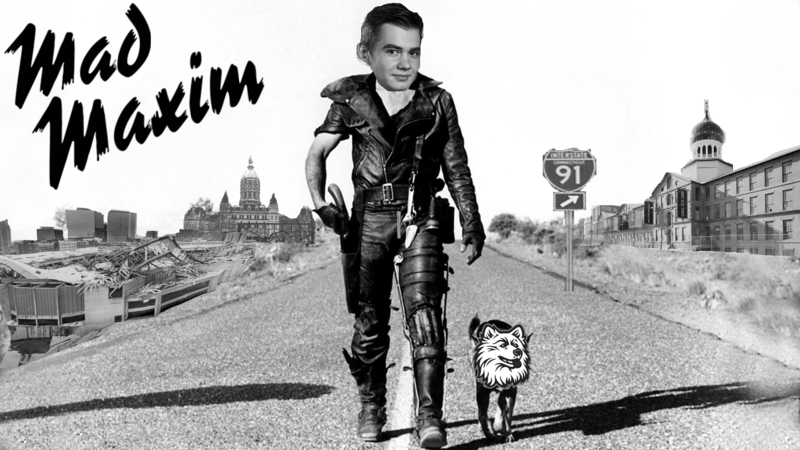 We are now one year into the journey of the Ice Bus and not only has it shown no sign of slowing, but a hero has emerged: a lanky 6’4″ freshman striding onto the post-apocalyptic wasteland which has become the XL Center under the snore-inducing reign of the Wolf Pack. Born halfway across the world in Russia barely a year before the Whalers left town, Max Letunov is an unlikely hero. He came to the Huskies late in the off-season as a last-minute recruit after a commitment to Boston University fell through due to administrative complications, and was only cleared to play for UConn this season in late August. He came through strong in his first game, not just scoring but netting a hat trick. Since then he has consistently been a multiple point-per-game player, earning 11 points in 5 games so far. It’s still very early, but anyone who followed the Huskies closely in their inaugural Hockey East season can already see the clear difference that his offensive ability has made in what was essentially the Rob Nichols Show just a few months earlier. 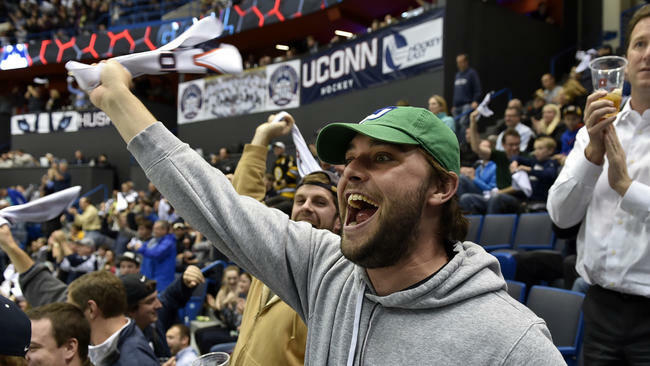 8000 Really Excited Guys in Whaler Hats: a fairly accurate sample of the crowd at UConn’s Hockey East home opener. The team we saw last year was better than they should have been, but in all honesty not a very good one. What they had was enough heart (and a great goalie) to win a few games they shouldn’t have. There could not have been a better introduction than the home opener, a sold-out crowd of 8000, many of them skeptical college hockey virgins who had been warned repeatedly to expect UConn to be trounced by Boston College. My expectations were similar to those of the many NHL refugees whom I call friends; we’d all found the downgrade to developmental AHL hockey underwhelming, and expected NCAA to be more of the same minus fighting. It sounded boring, and to be quite honest, I was mostly there because UConn had come to the Whalers Booster Club and requested permission to use Brass Bonanza on goal. I didn’t expect much from college hockey but it was nice to have a team that actually wanted us as fans again. Like most people, I was blown away by the atmosphere. The streets of Hartford were packed in a way they hadn’t been for years. There were lines outside of bars, crowds spilling out into the streets a full block before we reached the arena. And then they did the unthinkable; they won. Not only did we defeat a nationally-ranked team, but it was hated Boston College, AND it was a shut-out. Their fans, who travelled well and infested our crowd with the same arrogance of Bruins fans of yore, were stunned. The Huskies played hard, they played above their heads, but above all they played for us. 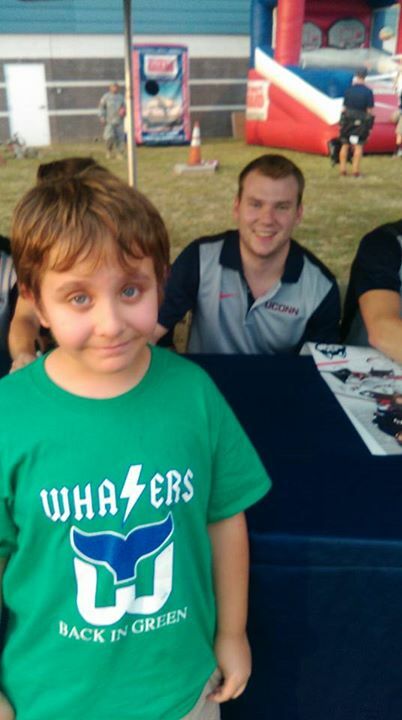 My son met Rob Nichols at a fan fest this summer and told him he was his favorite player next to Gordie Howe. I’m not sure which one of them was more overwhelmed. The team unravelled later in the season, but it mattered little. 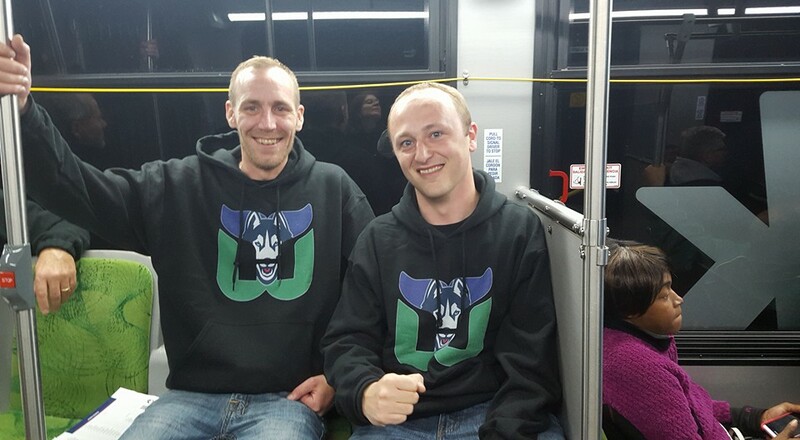 Hartford fans are slow to embrace a team, but once we do we’re loyal until death. Losing teams with heart are something of a tradition here. We set an attendance record for our opening night, probably the first time anyone had been turned away from a hockey game in Hartford since 1997, and went on to lead Hockey East in average attendance. As of this writing, UConn has committed to calling Hartford home for another three years, and there has been earnest discussion of a long-term (20 year) deal with UConn pending completion of the XL Center renovations. The mythical on-campus arena that threatened to steal the Huskies back to Storrs where they would return to irrelevance as a distant fourth wheel of UConn athletics is all but dead, the conversation now having shifted to renovating Freitas Ice Forum to be suitable as a practice facility and to host the occasional game when scheduling conflicts arise in Hartford. I’ll never understand the provincal mentality that leads residents of towns in this, the third smallest state in the Union, to see Storrs and Hartford as being warring nations with opposed interests. I’m just glad in this case that nay-sayers didn’t prevail. The Huskies have have captured lightning in a bottle in Hartford, and only a fool would try to let it out. Freshman and local boy Tage Thompson nets a hat trick in a 5-2 upset over #7 Boston University this past Tuesday. Listen to the crowd. Yes, this is Hartford. Yes, it was a Tuesday night. Some have accused we Hartfordites of only embracing UConn’s hockey team because of a nostalgic goal song, or because we perceived their success as a means to the end of realizing our NHL pipe dream. I’d be lying if I said those things didn’t play a part in catching my interest, but whatever comes of the new arena or the NHL, this will always be our team. Watch the video again and look at that crowd and you’ll see your fair share of old Whalers refugees, but you’ll also see a whole lot of kids who were infants (if they were born at all) when the Whalers left town. Every one of them clapping in time to the Brass Bonanza and just as elated as the old men in green; not because of nostalgia but because they’d heard it ten times in the last two games. This was our team, our tradition. Kept alive by our heroes. Those of us who remember the difference Ron Francis made, both in his coming and going, know how much heroes matter in a place like Hartford. Mark my words: Letunov, Naas, Thompson and Nichols are names that will be spoken of fondly over a beer at Vaughn’s for years to come. We’re all aboard the Ice Bus.